Inside: Don’t let perfectionism poison your thoughts or spoil your progress anymore. Take a deep dive into practical steps for overcoming perfectionism. Including detailed examples for those who identify with being a perfectionist and pregnant. Many pregnant women suffer with the unspoken concern that they are not enough – not good enough to be a mother, not doing enough to be healthy in pregnancy, not protecting their unborn child as they “should.” Because this worry strikes at the very heart of who we are – our capability, competency, confidence – and our child’s future, we rarely talk about it. It makes us feel guilty and ashamed. But, we’ve found most women struggle with feeling good enough at some time or another. Some experience it more intensely. Some experience it for years. To me, it is a sad reality that many women struggle with feeling imperfect, not enough, and inadequate across the whole of their lives. Most psychologists agree that perfectionism is a personality trait. It’s a part of who we are and one that has been with us most of our lives. It can range from being a very dominant and obvious part of our personality that is evident in our conversations and actions, or it can be milder and less obvious. There is also a range of healthy to unhealthy perfectionism. Unhealthy perfectionism is having unreasonable, unreachable goals. You set goals that are way too high. When you meet them, you believe you did so because they were easy goals, set too low, or some external circumstance made it easy and doable to achieve them. When you don’t reach your goals, your confidence drops, and you feel unworthy and incompetent. You believe that this lack of goal attainment is a marker of your failure and inadequate abilities. You believe that you will not be successful going forward and this situation is evidence of that truth. Where Does My Need to Be Perfect Come From? It’s natural to want to understand why we are the way we are. It brings us understanding and comfort – as well as a place to begin. Both healthy and unhealthy perfectionism tends to originate with experiences from your childhood family. You may have had parents who strongly valued success and accomplishment and you’ve internalized those values and a mental model of what a successful person looks like. In many cases, both healthy and unhealthy perfectionism leads to career success, and you experience the positive aspects of your upbringing. The problem with unhealthy perfectionism is that it is not sustainable. Over time, unhealthy perfectionists feel more and more pain. Pregnancy seems to bring this out to the forefront as well. You may feel it in the way that you react to well-meaning pregnancy advice from a friend or colleague with worry, self-doubt, guilt, insecurity, or self-loathing. Thoughts of inadequacy and incompetency circle around in your mind and drive your joy away. You may experience anxiety and exhaustion from just trying to be perfect…or at least adequate. Enough. These feelings and experiences will not disappear on their own. Many women find that they get worse over time, especially after the baby is born. Parenting is a journey of difficult decisions and situations for which there is no manual or playbook. 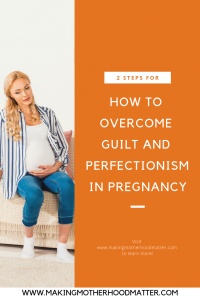 When you don’t manage unhealthy perfectionism, each of these situations becomes a cycle of doubt, guilt, worry, and anxiety about whether you’ve done the “right” thing for your child, his future, and your family. It’s no wonder that by middle-age women are exhausted and rates of depression and anxiety increase after spending a lifetime worrying about whether they’ve been “enough” for their child and family. You can shift your unhealthy perfectionism tendencies today. It is hard and constant work at first, but gets easier over time. In our work, we teach about the cognitive triangle. Every action you take and every word you say is driven by emotions and thoughts. If a colleague at work tells you that you should be eating different foods to keep your unborn baby healthy, your thoughts may spiral into: I should be doing better; I knew I wasn’t doing what I should be doing; I thought I was doing OK, but clearly I’m not; Why did I think I could be a good mother in the first place; I must not be reading the right information; How could I be so stupid. From those thoughts that you are less-than-perfect, your emotions kick in: shame, embarrassment, self-loathing, worry, anxiety, distraught, suspicious, frustrated, and unsettled. Then, you act on the basis of these negative thoughts and stirred up emotions. You might say something rash to your colleague that affects the relationship. However, you might not say anything and hold in your negative emotions so that you become more upset, frustrated, and distressed. You might go to the refrigerator and indulge a large bowl of ice cream followed by two cream-filled, chocolate covered eclairs. Or, you might get into an argument with your partner when you walk in the door after work. At that moment, you are a long way away from what all people need and want – and what you need and want: safety, security, belonging, love, self-acceptance, and competence. To get what you want and need – a sense of competence that you are a good person and will be a good mother, confidence that you are doing the best for your unborn baby and family, self-assurance that you are “enough” as a person and mother-to-be – begins with your thoughts. Your thoughts are driving your emotions and actions. When you change your thoughts, you shift your emotions and actions. We’re learning that so much of emotional health depends on how we manage our brains. This is especially true for perfectionists, who have become so used to patterns of perfectionistic thinking that it feels normal. It’s not. Healthy perfectionists think, feel, and act from their upper brain – the prefrontal cortex of the brain. They are decisive and intentional. They attack goals with optimism and a sense of hope and possibility. When their goals are not achieved, the use their creativity to find another solution or path. We experience purpose, joy, and gratitude. Unhealthy perfectionists think, feel, and act from their lower brain. The lower brain has one drive, and that is to be safe and secure. It sees the world through the lens of threat. That’s why unhealthy perfectionists are plagued with thoughts that they are not enough, and bad outcomes will result from their inadequacy. The Key to Managing Perfectionism is Living from the Upper Brain – Here Are 2 Simple Steps! When you have the thought that you are inadequate, imperfect, unworthy, or not enough, flag it. The first step is always recognizing that thought in the moment. Think of how the situation you are in could be used as an opportunity. Ask yourself: What is the possibility in this situation? How could this situation be used for my growth? Think a thought of gratitude. You might start with a phrase such as, “In this moment, I am thankful that…….” It is striking how fast a single thought of gratitude can flip you from lower- to upper-brain thinking. Deep breathing. Do this while you are thinking of the possibility in the situation, or a thought of gratitude. It’s amazing how this small act can help to physiologically reset your brain. At first, identifying your unhealthy perfectionistic thoughts and flipping them to the upper brain takes hard, constant work. But after even a few times of intentionally flipping the switch, it gets easier, and you start to feel confident and competent about managing your thoughts. Instead of being controlled by your lower brain’s perfectionistic thinking, you are liberated to live from the upper brain in joy, growth, creativity, and possibility. The best part is that these are strategies you can teach your child as she grows to help her to be more resilient and in tune with her own thinking, emotions, and actions. How Do I Know that I’m an Unhealthy Perfectionist? 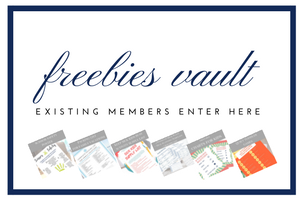 If you would like to know if you are struggling with unhealthy perfectionism, download this simple self-screening tool in the author bio section below. P.S. If you enjoyed this piece, you might also like 10 Pregnancy Essentials That Will Make Your Life Better.